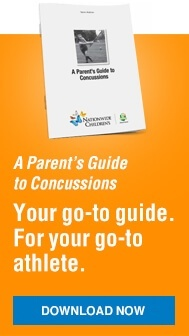 “Any athlete who exhibits signs, symptoms or behaviors consistent with a concussion (such as loss of consciousness, headache, dizziness, confusion or balance problems) shall be immediately removed from the contest and shall not return to play until cleared with written authorization by an appropriate health care professional. In Ohio, an “appropriate health care professional” shall be a physician (doctors of medicine (M.D.) and doctors of osteopathy (D.O. )), or a certified athletic trainer." What is the role of coaches in administering this rule? Coaches shall be aware that any student removed from a practice or a contest due to a suspected concussion or head injury shall not return to participation on the same day as the removal. What is the role of contest officials in administering the rule? Officials are to review and know the signs and symptoms of concussion and to direct immediate removal of any athlete who displays these signs or symptoms. An official shall not permit the athlete who has been removed under this rule to return to competition that same day. Note that officials are not medical professionals and have no authority to determine whether or not student has sustained a concussion. The official is responsible for directing removal when he or she observes signs and symptoms that may indicate a student is concussed. No, under no circumstances can that athlete return to play that day. No coach or contest official shall allow a student to return to practice or to competition on any day after the initial removal until that student has been assessed and cleared for return with written authorization by a physician or licensed health care provider authorized by the school. Who can issue authorization to return to practice/competition in the sport? Once a concussion has been diagnosed by one of the above listed on site providers, only a physician (MD or DO) or approved provider (such as an athletic trainer) can authorize subsequent return to play (RTP), and such authorization shall be in writing to the administration of the school. If any of these individuals deems that there has been a concussion and the athlete is not ready to return to play, that decision is final. What should be done after the student is cleared by an appropriate health care professional? After a clearance has been issued, the student’s actual return to practice and play should follow a graduated protocol suggested by the National Federation of High Schools and directed by the physician or athletic trainer clearing the athlete for activity.